Many seniors prefer to age in the comfort of home, surrounded by familiar objects, sounds, and people. To ensure your aging loved one receives high-quality care at home, consider using live-in home care. Here are some of the benefits live-in home care provides older adults. Make sure your loved one has someone inside of the home to help him or her move around and prevent falls and serious traumas. A caregiver can also assist your loved one with moving items and packages and performing household chores that are potentially dangerous. If an accident occurs, the caregiver can immediately take your loved one to a doctor. Many seniors prefer aging in place over moving to an assisted living facility. If your senior loved one needs assistance to remain safe and comfortable while living at home, reach out to Home Care Assistance, a leading Winnipeg, MB, elder care agency. Our dedicated in-home caregivers can assist with meal prep, bathing and grooming, exercise, medication reminders, and many other important tasks. Receiving care inside of the home could prevent seniors from moving to an assisted living facility. Living at home can enhance mood and increase longevity. As a result, seniors can stay at home and continue with their daily routines. Caregivers encourage seniors to do as much as they can independently. Maintaining some independence can boost the mental, physical, and emotional health of aging adults. With live-in home care, your loved one has the full attention of a caregiver. In a rehabilitation center or retirement home, seniors often have to share caregivers. Receiving one-on-one care can reduce the risk of accidents and injuries and give you peace of mind while you are away. One of the top issues for seniors is isolation. It is easy for older adults to become inactive and isolate themselves inside of their homes. When seniors become isolated, their mental and physical health may decrease, putting them at a higher risk of developing heart issues, memory loss, and other serious conditions. With live-in-home care, seniors have someone there to provide them with daily assistance and companionship. For families living in Winnipeg, MB, respite care can be a wonderful solution when their aging loved ones need companionship and socialization a few hours a week or just need minor assistance with daily household tasks. At Home Care Assistance, we thrive on helping seniors maintain their independence while living in the comfort of home. Many seniors want to maintain control over their lives and have a choice in the type of care they receive. Live-in-home care gives your loved one more choices and provides the dignity he or she deserves. With assisted living, seniors lose some of the choices they have, which could make them feel less dignified. Families have more flexibility when they opt for live-in home care. As their loved one’s needs change, his or her caregiver can change the care plan accordingly. For seniors who need assistance with grooming, cooking, bathing, and mobility, families can hire a caregiver to help in those areas. If your loved one is living with a chronic illness such as dementia, you can hire someone skilled in this area. Live-in home care providers can tailor plans to meet your loved one’s specific needs. Caring for an elderly loved one can be a challenging role, and there will be times when you need breaks, especially if you have to balance a professional career and a family of your own. With live-in home care, families receive the support they need and deserve. Hiring a live-in home caregiver can prevent caregiver burnout and other health issues. 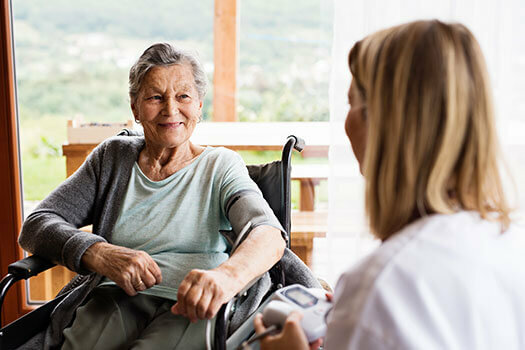 If your elderly loved one needs help maintaining a high quality of life while aging in place, reach out to Home Care Assistance, a trusted provider of Winnipeg home care. Services our caregivers provide include transportation to and from medical appointments and social events, nutritious meal preparation, assistance with daily exercise, and help with everyday tasks like bathing, grooming, and light housekeeping. To learn about our high-quality in-home care options, call us at (204) 489 6000 today.